2004; 463 pages. Translated by Maureen Freely. Genre : Contemporary Literature. 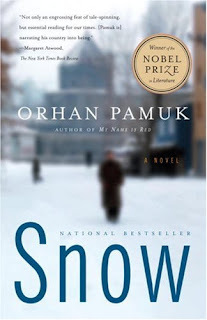 Awards : One of the NY Times "10 Best Books of 2004"; Pamuk won the 2006 Nobel Prize in Literature. It was the first Nobel Prize in any category ever awarded to a Turkish citizen. Overall Rating : A-. An exiled poet named Ka returns from Frankfurt to Kars, a small, impoverished city close to Armenia in eastern Turkey. His official reason is to do investigative reports on the upcoming local elections and the wave of suicides by teenage girls reportedly protesting the head scarf ban. But he also wants to look up an old flame, Ipek, now recently divorced from an Islamist. Things get complicated when a touring actor, along with a hometown Colonel, stage a local coup and begin arresting anyone who isn't a loyal nationalist. The character development is excellent. Our hero Ka, for instance, is a mixture of dark and light. He is artistic and idealistic, yet naive and not very loyal. He can manipulate disparate factions into signing a proclamation protesting the coup, yet is equally manipulated by the Islamists, the coup leaders, and the secret police. He's handsome and charming enough to convince Ipek to move to Germany with him, yet his idea of "love" is for him to enable Ipek to go shopping for western clothes in Frankfurt, at the cost of her being hopelessly dependent on him because she's so far removed from her family in Turkey. The story subordinates to Pamuk's look at the deep and varied issues and forces that pull at modern Turkey. The forces include militant Islamists, Kurdish separatists, secularists ("atheists" if you aren''t one), the Army, the Secret Police (which isn't the same as the military), the Attaturk nationalists, and the family unit. The issues include the wearing of the head scarf, suicide as an unpardonable sin in Islam, finding God, "east versus west", the hopeless plight of the Turkish poor, the widespread wiretapping and bugging of Turkish citizens, and something we in the USA can't relate to - how to live with recurring military coups. Amazingly, Pamuk treats all these forces and issues impartially. None are "all white"; none are "all black". If anything, he succeeds in painting them all the same shade of gray. You won't find any answers here, but you will gain deep insight into the complexity that is Turkey. We're Not Stupid; We're Just Poor. I have present- and past-life ties to Turkey, so I found Snow to be fascinating. It reminded me of Toni Morrison's Beloved though. If you can relate, it's great. If Turkey and head scarves and Kurds and modern-day Islam don't hold much interest to you, then this may be a slow and tedious read. This sounds really interesting. This is probably a stupid question, but what was the original language? Turkish. i think you'd enjoy it, given that the Palestinians suffer the same sort of stigma that the Turks do. i was impressed with his impartiality. what i don't know is whether his countrymen are equally impressed. i've asked one of my Turkish colleagues about this, but haven't heard back from him yet. he's the one that turned me on to Pamuk, so i'm pretty sure he's read Snow. I really want to go to Turkey someday.